A whole new way to play has come to the Wiregrass! Suited Aces Entertainment, LLC is a casino party company in Dothan, Alabama that provides casino-style entertainment to the Wiregrass area, including Ozark, Enterprise, Daleville, and surrounding areas. 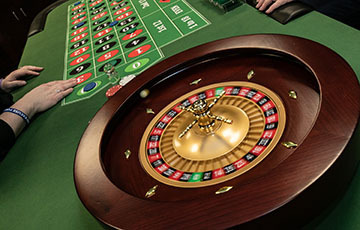 Casino theme parties offer a unique, exciting experience for your guests. Our courteous, professional staff deal real casino games just like they do in Vegas, and we're happy to help players learn how to play the games and fully enjoy the experience. Let us make your next corporate event, fundraiser, sales conference, or special event truly a night to remember! Corporate events, wedding receptions, poker tournaments, fundraisers – Suited Aces Entertainment, LLC can bring the excitement and fun of a real casino to your special occasion. We bring the gaming tables, equipment, and professional dealers to your event. Guests are given a predetermined number of starter chips or "fun money" that can be used to play any of the authentic casino games offered. We will make sure that all of your guests have an amazing, memorable experience! ◆ And more coming soon! So, how does a casino party work? We arrive at your event early to set up our gaming tables, chairs, and all of the necessary equipment to play. Your guests will receive a predetermined amount of "fun money" that can be traded for chips at any of the gaming tables, where they can start playing right away. Guests are free to move from table to table as they please and enjoy the casino-like atmosphere, without ever risking any real money! Yes! Casino parties provide the fun, exciting atmosphere of an actual casino, but no real money is ever wagered or exchanged at any time. 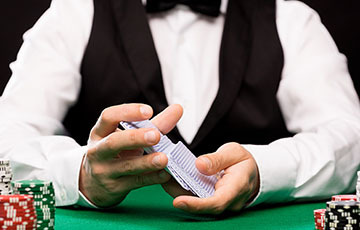 Suited Aces is strictly an entertainment company and we provide mock-casino entertainment services. How many game tables will I need for my event? We recommend choosing a package that has seats for 75% of your guests, since not all guests will be playing at all times. If there will be other forms of entertainment at your event (live music, food, etc), then we recommend providing tables that can seat 50% of your guests. When will you set up and tear down your equipment? We will arrive early to set up all equipment so that it is ready for the start of your 3-hour gaming window. We begin tearing down and packing up shortly after the end of the session. Dealers are occasionally given tips from guests (or event staff) who have been given excellent service and wish to show their gratitude monetarily. No tip jars will ever appear on gaming tables, and tips are never solicited. How this is handled is up to the event host. Typically, guests are able to receive another starter amount of chips if they run out during the event. 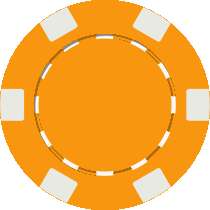 If the event is a fundraiser, the guest could be asked to make an additional donation to receive more chips. Do guests need to know in advance how to play the games? No! Our friendly, courteous dealers are there to make sure that all guests have a great time and will provide tutorials and basic strategy for all games we provide. Do you provide any prizes for the high-rollers? While Suited Aces Entertainment, LLC doesn't provide any prizes, we can "cash out" players' chips at the end of the session for branded "fun money" that makes a fun souvenier. Event organizers sometimes hold a raffle at the end of the event and award their own prizes to the high rollers. ◆ Quotes are guaranteed for 14 days. ◆ A 10% deposit is required to secure any booking, and the remainder is due by the completion of the event. ◆ No booking is guaranteed until both parties have executed a contract and the deposit is paid. ◆ Deposits are fully refundable if cancellation is received at least 14 days prior to your event. ◆ We reserve the right to refuse any bookings at our discretion based on availability, location, etc. ◆ Prices are based on events within a 30 mile radius of downtown Dothan, Alabama. Additional fees will apply to events outside of this area. ◆ Events last for a continuous 3 hours, with setup and removal occurring before and after the 3-hour gaming window. ◆ We will set up at non-smoking areas only. ◆ Guests are asked not to eat food at our gaming tables. Includes a professional dealer, all necessary equipment to play, and three (3) hours of continuous playing time. Supports up to 7 concurrent players. Suitable for events with up to 10 total guests. Includes two professional dealers, all necessary equipment to play, and three (3) hours of continuous playing time. Supports up to 14 concurrent players. Suitable for events with up to 20 total guests. Includes three professional dealers, all necessary equipment to play, and three (3) hours of continuous playing time. Supports up to 22 concurrent players. Suitable for events with up to 32 total guests. Includes four professional dealers, all necessary equipment to play, and three (3) hours of continuous playing time. Supports up to 30 concurrent players. Suitable for events with up to 43 total guests. Includes five professional dealers, all necessary equipment to play, and three (3) hours of continuous playing time. Supports up to 37 concurrent players. Suitable for events with up to 53 total guests. Ready to book your casino party? Great! Have some questions for us? We're happy to help! Just fill in your information below, and we'll contact you as soon as possible. I'm interested in this package: Choose a package... 1. "High Card" - Choice of Blackjack or Texas Hold'em Poker 2. "One Pair" - Two games: Blackjack and Texas Hold'em Poker 3. 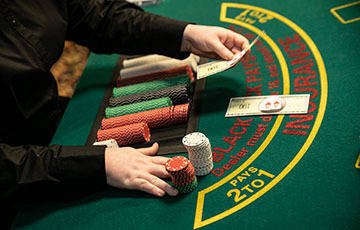 "Trips" - Three games: Blackjack, Texas Hold'em Poker, and choice of Craps or Roulette 4. "Quads" - Four games: Blackjack, Texas Hold'em Poker, Craps, and Roulette 5. "Royal Flush" - Five games: Two Blackjack, Texas Hold'em Poker, Craps, and Roulette I'd like a configuration that isn't listed here. Please check the box below and submit again.